Tony Jenkins shared his BLISS Model of Conflict Resolution. Hosted by Rick Kennedy Conflict is an unavoidable part of life. Even so, many people go to great lengths to avoid any kind of disagreement. But working through a conflict can be a great learning exercise, and can often lead to healthy discussion and better outcomes. How do we learn to navigate conflict, especially when our emotions are in play? 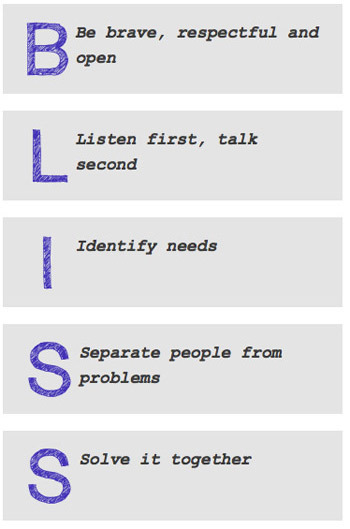 The BLISS model is a structured way to resolve conflict between two or more individuals. At its core, BLISS is a set of five guiding principles that will help you navigate a conflict and find a workable solution. The BLISS approach can be used with an individual client who’s facing a tough conversation, or it can be taught to two (or more) people who need to work through a disagreement. This workshop teaches you a simple way to address and resolve conflict using direct communication and 5 guiding principles. The BLISS model was developed by Tony Jenkins, an Executive Coach who focuses on management and leadership development with his clients.